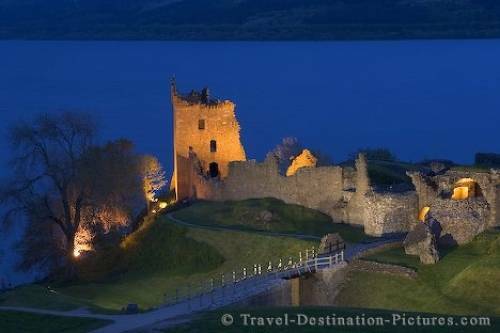 The ancient ruin of Urquhart Castle at the banks of the famous -monster infested- Loch Ness is a special sight at nightfall, when the ruin lies illuminated in front of the quiet lake. The ruin was named after an irish monk, who came here in the first millenium to christianize the picts, the ancient scottish tribes. Loch Ness in Scotland, UK.